Basil and rosemary and mint, oh my! I love plants but am terrible at taking care of them. After unsuccessfully trying to raise a basil plant and a cactus (RIP), I was beginning to think that gardening wasn't for me. Because I live in New York City and don't have a backyard (heck, I don't even have a washer/dryer), there's not much room to experiment. 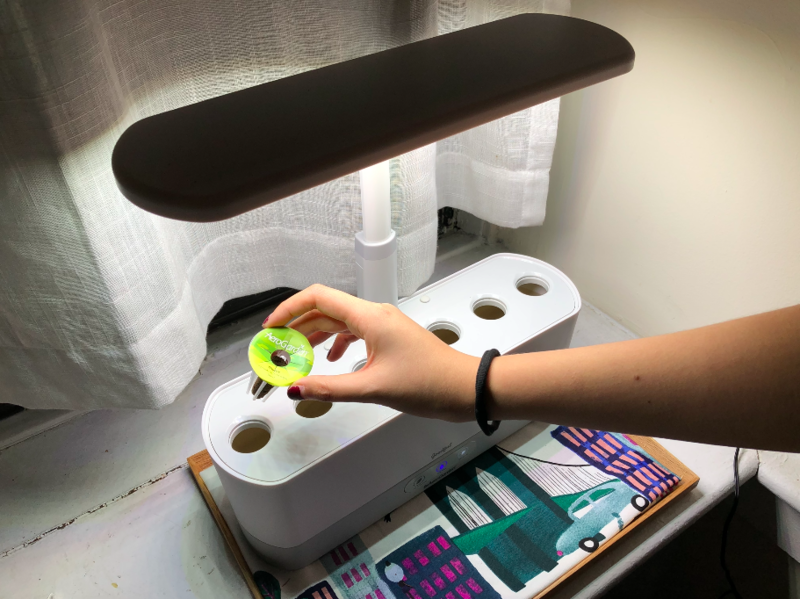 The Aerogarden will alert you with flashing lights when the plants need more food or water, and the LED grow lights automatically come on and shut off every day so you don't have to watch over it. The system basically does ALL the work for you — and that's just perfect for someone as clueless as me! Setup was very easy — the instruction pamphlet walks you through everything step by step — and all I had to do was plug in a couple of wires, fill up the tank with water, add a capful of the included Miracle-Gro plant food, and insert the seed pods. Done! 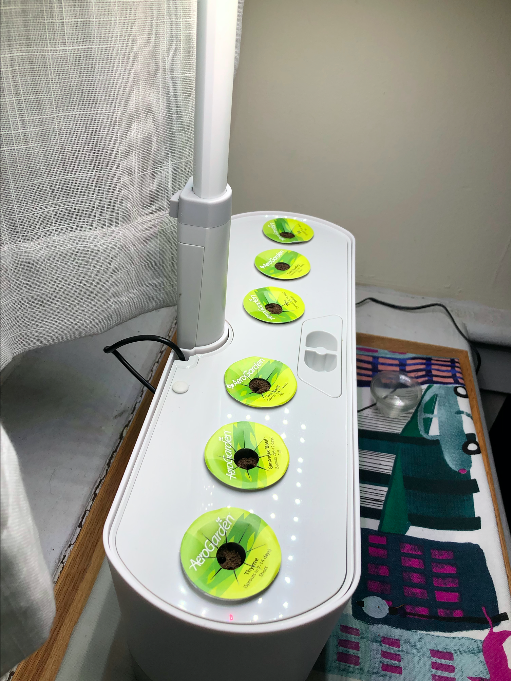 I think the most challenging part for me was finding a good spot to put the Aerogarden; it needs to be close to an outlet (which are limited in my apartment) and sort of out of the way so you don't have to move it around. I settled for my windowsill, which is honestly the only area that isn't cluttered up with books and knick-knacks. The good thing is you don't HAVE to keep it near sunlight — just wherever you have the room for it. Its slim design also ensures that it won't take up a ton of counter space. 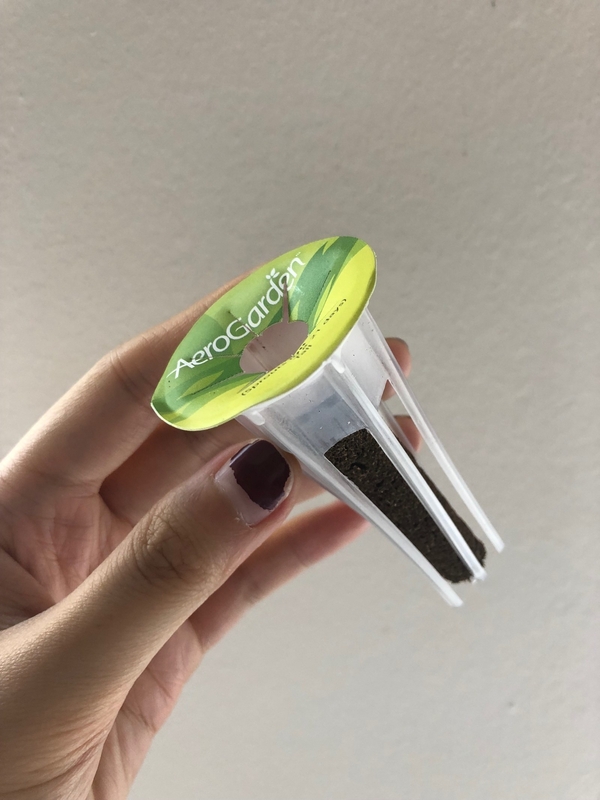 The pods are little cones of soil that contain the seeds, so I didn't actually have to do any ~planting~ — I just popped them right into the holes. It was very satisfying to do, actually. The cones also tell you how long the plants take to sprout typically. For example, the Genovese basil takes 6 to 12 days, whereas the dill takes 8 to 21 days. Once everything was loaded up, I just turned the LED grow lights on and voila! My plant babies were ready to go. You can actually program the light to come on every day at the same time, so I set it to turn on at 7 a.m. each day. It automatically shuts off after the plants have received enough light for the day. From there, it was just a waiting game. I've never had a countertop garden before so I wasn't sure what to expect. But I am happy to report that after two weeks, ALL of the herbs have sprouted and the seedlings are in excellent shape — with basically zero effort on my part! As expected, the plant-food light flashed after two weeks, and I was reminded to add two capfuls of Miracle-Gro into the water. As a forgetful person, I really appreciate this feature! I haven't had the water light flash yet, simply because I always fill the water up after a few days (the instruction pamphlet encourages you to keep the water at full level). One of the things I love the most about this kit is how helpful the instructions are — it tells you how to take care of the plants, how to clean the machine, how to troubleshoot issues that come up — so you're not left feeling confused and paranoid that you've done something incorrectly. I never thought I'd be successful at growing *anything* and now it's a joy for me watch the seedlings' progress every day. It's amazing how big of a difference some greenery can make in an apartment — it just feels so much more ~lively~. Bonus: the minimalist look of the Aerogarden also fits in with the decor of my apartment. I haven't actually tried any of the herbs yet because the plants are still tiny, but the prospect of having fresh herbs at my disposal year-round is super exciting! Get it from BuzzFeed's Goodful line, exclusively at Macy's for $189.99. 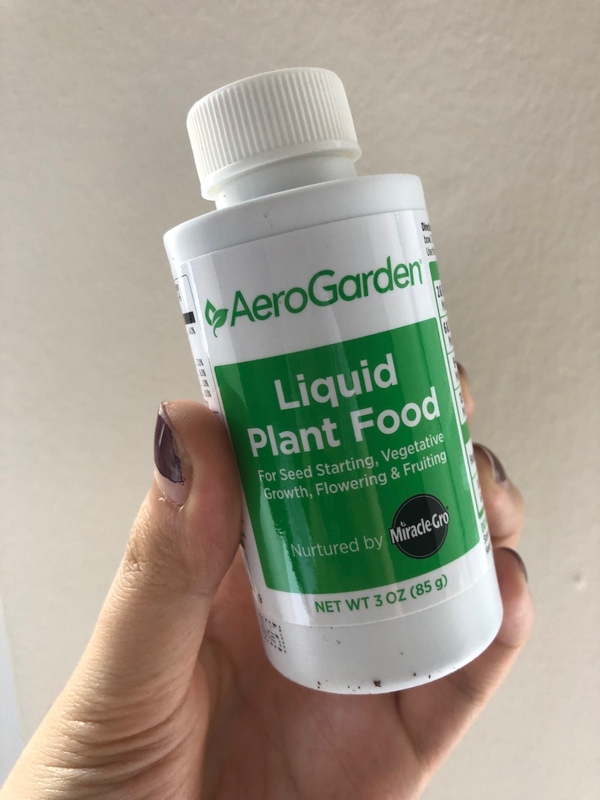 Watch this Tasty video to see the Goodful Aerogarden in action and get some amazing recipes that'll put your homegrown herbs and veggies to good use! You'll also see what the herbs look like when they're fully grown! Looking for more awesome plant-related products? Check out one of these lists!